The Certified Public Accountant - CPA - Board Exam Results for May 2015 - Complete list of passers, top ten passers, top performing schools and performance of all participating schools will be posted here as soon as the Professional Regulation Commission (PRC) released the list of passers. The Professional Regulation Commission held the CPA board examination on May 10,11,17 and 18 of this year in seven testing centers nationwide, namely: Manila, Baguio, Cagayan de Oro, Davao, Iloilo and Legazpi. The Professional Regulation Commission Board of Accountancy (PRC-BoA) is composed of Joel L. Tan-Torres, Chairman; Betty C. Siy-Yap, Vice Chairman; Eliseo A. Aurellado and Gerard B. Sanvictores, Members. According to the Professional Regulation Commission Board of Accountancy (PRC-BoA), the initial target release date for the may 2015 CPA exam results is on May 21, 2015. That would be exactly three days after the last day of examination that is why it is expected that the examiners as well as their families and love ones to flock on the internet for the list of passers right after the last day of the examination. Based on Keywordspeak.com's years of experience, the official website of the Professional Regulation Commission (PRC) at www.prc.gov.ph is usually flooded with page requests from the examiners that is why it is usually overwhelemed with visitors making it offline for their 90% of users. It is a common knowledge that government website's servers to crash for huge spike of online traffic that is why Keywordspeak.com is echoing the test results to serve the CPA board examiners and their families. The data posted on this webpage are directly came from the PRC to ensure data reliability and integrity. Keywordspeak.com also uses Google server to ensure that we can serve more visitors that the Professional Regulation Commission official website can accomodate. Google is a reliable muti-billion dollar company that also offer web hosting servers where Keywordspeak.com is plugged-in. Based on our data from years of experience in echoing the Certified Public Accountant (CPA) Board Examination Results, it is usually done as a four-day examination and was usually done in seven up to eight different testing centers nationwide. The CPA board examination is the third largest examination that the Professional Regulation Commission (PRC) is conducting after the Licensure Examination for Teacher (LET) and Nurse Licensure Examination (NLE). Last year's Accountant Board Examination was held on the months of July and October, only three months apart, a very close date of examination contrary to the usual May and October examination which was held on the year 2013, 2012 and 2011. 2015 CPA tests were also brought back to the traditional May and October exam dates. For the July 2014 test, the Professional Regulation Commission (PRC) announces that 1,107 out of 5,540 passed the Certified Public Accountant Licensure Examination given by the Board of Accountancy in the cities of Manila, Baguio, Cagayan De Oro, Cebu, Davao, Iloilo and Legazpi. The results were released on August 1, 2014 or exactly three days after the last day of the examination which was held on July 20, 221, 28 and 29, 2014. ROMMEL RHINO CATUDIO EDUSMA from ASIAN DEVELOPMENT FOUNDATION COLLEGE was held as the top notcher garnering the highest rating of 94.57%. For the October 2014 test, the Professional Regulation Commission (PRC) announces that 4,123 out of 11,137 passed the Certified Public Accountant Licensure Examination given by the Board of Accountancy in the cities of Manila, Baguio, Cagayan De Oro, Cebu, Davao, Iloilo, Legazpi and Lucena. The results were also released on October 15, 2014 or exactly three days after the last day of the examination which was held on October 4, 5, 11 and 12, 2014. MARK ANTHONY BLANCO TACUBOY from UNIVERSITY OF SAINT LOUIS-TUGUEGARAO was hailed as the top notcher garnering the highest rating of 91.14%. Both 2014 examinations have the Board of Accountancy composed of Joel L. Tan-Torres, Chairman; Betty C. Siy-Yap, Vice Chairman; Eliseo A. Aurellado and Gerard B. Sanvictores, Members. Based on the data from the two latest CPA board exam that was held by the PRC, it is expected that the May 2015 Accountant board exam results will also be released after three days from the last day of the May 2015 exam. Visit this site more often to be the first know the results as soon as they came up. For the meantime, please be informed that Registration for the issuance of Professional Identification Card (ID) and Certificate of Registration will also soon be announced. Those who will register are required to bring the following: duly accomplished Oath Form or Panunumpa ng Propesyonal, current Community Tax Certificate (cedula), 1 piece passport size picture (colored with white background and complete nametag), 2 sets of metered documentary stamps and 1 short brown envelope with name and profession and to pay the Initial Registration Fee of P600 and Annual Registration Fee of P450 for 2014-2017. Successful examinees should personally register and sign in the Roster of Registered Professionals. Like us on facebook to receive timely updates regarding the CPA May 2015 board examination results, facebook like button can be found at the bottom part of this page. Share this page too, facebook share button can be found on the left part of this page. The whole keywordspeak.com team is looking forward for a high passing rate this time. May your sleepless nights bear fruits on this endeavor. We are all looking forward for you to find your name on the passers' list soon! Please stand by for a more accurate and timely updates. More updates will be posted after this line. 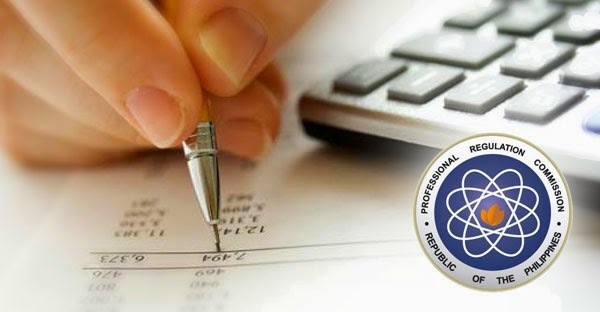 The Professional Regulation Commission (PRC) announces that 2,132 out of 5,959 passed the Certified Public Accountant Licensure Examination given by the Board of Accountancy in the cities of Manila, Baguio, Cagayan De Oro, Cebu, Davao, Iloilo and Legazpi this May 2015.